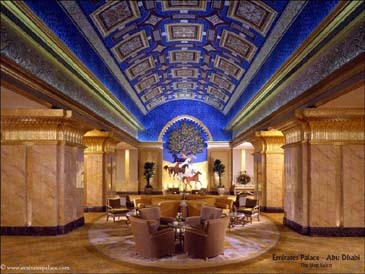 Majestic view of Emirates Palace lobby. Abu Dhabi, UAE — Like Taj Mahal of India, Eiffel Tower in Paris and Liberty Statute in New York, the Emirates Palace Hotel in Abu Dhabi stands out as a tourist edifice that has become the focus of attention of celebrities and businessmen from around the world. The Hotel Emirates Palace, according to its new general manager Noel Masoud, is an enchanting landmark that's a wonder to behold for all who venture through its magnificent gates. "The hotel was built to the highest standards of magnificence, elegance and Arab originality," he noted. Masoud expects that the Emirates Palace would evoke a qualitative leap in the tourism industry in Abu Dhabi in particular and UAE in general. 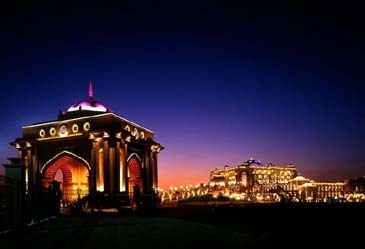 Fantastic view of Emirates Palace in the night. "It is unique and perhaps unrivalled in the whole world. 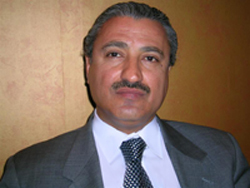 However, it is difficult to apply the same classification of other hotels to it," he said. This hotel, he adds, is a masterpiece with its exquisite galleries and lobbies and its fascinating oriental atmospheres. Built in the shape of an Arabian palace on Abu Dhabi shore, the hotel is painted in Arabian desert-like colors with 114 domes, coated with mosaic colored panes of glass decorating, its roofs. The conference center attached to the hotel, Masoud goes on to say, is equipped with state of the art facilities and can host international gatherings and accommodate 1200 persons. This is in addition to a ballroom for parties that can house 2000 persons plus other 40 meeting halls with an advanced media centre. Fairytales come to life as your senses are treated to an extraordinary and unforgettable experience. Breathe the air of luxury that fills every corner of this serene paradise. The Emirates Palace, a landmark that that breathes the air of luxury, borrows its architecture designs from Arab palaces, reflecting the identity of the United Arab Emirates. It has 302 superior rooms and 92 magnificent suites. The conference centre is the most technologically advanced meeting facility in the region. It has an auditorium with seating for 1,200 guests, a main ballroom capable of accommodating 2,000 persons, 40 meeting rooms, a media center and 12 pressrooms. The Palace also boasts six large terraces and variety of pre-function areas, a landscape park with open lawns, a 1.3-kilometer private golden sands beach, two swimming pools, and two spas. The Emirates Palace is managed by the Kempnski Hotels & Resorts.